Review: Yianni: Numb And Number – Canon’s Gait, Edinburgh. As a comedy punter and sometime reviewer I wholeheartedly endorse PBH’s Free Fringe. Some turn their nose up at the very notion of free comedy, while others would rather not take the risk, but to my mind there is no performer better demonstrating the spirit of the Fringe than Yianni’s Numb and Number. The show itself is not your typical free venture – it’s so much more than that. Yianni takes the audience on a comprehensive guide of numbers and what they mean to him after being diagnosed with Autism earlier in the year. The numbers theme is constructed so fluently throughout the hour, and every possible angle is squeezed for laughs and painfully analysed. Numbers really have no reason to be this funny, and it’s admirable that he really makes it work. Yianni may also be able to boast the most attentively organised show on the Free Fringe with a largely popular viral campaign advertising his show, printed programmes handed out at the top of the show and flyers in the form of those origami ‘pick a number, pick a colour’ fortune teller games – if you’re clever enough to remember how you folded them when you were a kid. These small additions to the overall package, while obviously irrelevant to the show, make the world of difference in terms of branding; so this show stands out amongst some of the more homogenised free shows on offer. Yianni feels like something new and refreshing in a world where so much can be the same. Such attention to detail, however, is exactly why this show works…and also possibly how his Autism was diagnosed. But it gets you an audience and Yianni doesn’t disappoint. If anything, he builds and builds in an hour on the hilarity contained in that short ad, which he plays to kick things off at the start of the show. I think you’d be pressed to find an equal or better show performing for free in Edinburgh this year. 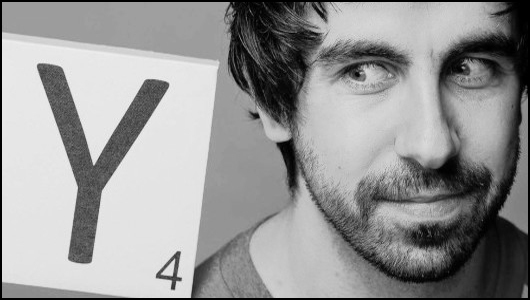 Yianni’s visual and numerical journey of ridiculous, charming, friendly and, at times, even thought-provoking humour really sets the bar for bucket shakers at the Fringe.